GRAB AN EXCLUSIVE PFS REWARD HERE! Mention Parent Friendly Stays when you book a family holiday at the Quintassential and receive an exclusive free bottle of local bubbly! The Quintassential is located in the Central Algarve, only a short 20 minute drive from Faro International Airport. The colourful market town of Loulé, one of the oldest towns in the region, is only five minutes away and offers a bustling Saturday morning market to locals and tourists alike. Beautiful blue flag beaches, golf courses and the Algarve’s best water park – Aquashow – are all within a 15 minute drive. There are plenty of other child and family friendly activities in the area including swimming with dolphins at Zoomarine, family golf in Vilamoura, karting and water activities on the beaches, and watching sea dolphins. The Quintassential offers a choice of four holiday cottages, all set on an attractive family run complex set at a dramatic 1200 feet above sea level with beautiful views down to the coast. The largest property, Orange Cottage, sleeps up to four people plus an infant in a cot, while the others accommodate a couple plus one child. All the properties at the Quintassential are furnished, equipped and decorated to a high standard. And as an additional bonus, they’re all south facing with panoramic sea views and private sun terraces with brick built BBQ area. The owners live on site and are always happy to assist guests as needed or to provide local knowledge on the area. Prices at the Quintassential are very reasonable, in our view: Orange Cottage, for example, rangrs from £435/week out of season up to £995 in August – we don’t think that’s bad at all given the facilities on offer and quality of the accommodation. The Quintessential is undoubtedly designed with children in mind and is well equipped for those families who are most likely flying to Portugal without the ability to bring all their usual entertainment with them. The cottages have shared access to a beautiful terraced outdoor heated pool area with sun loungers – thoughtfully gated off for peace of mind for parents with wandering toddlers. There’s also a children’s play area with swings, slides, playhouse and toddler trampoline, along with a larger trampoline and table tennis for older kids. The Quintessential also benefits from over an acre of safe grounds to explore and let off steam. Each cottage has its own paddling pool on the private terrace, and properties also come with a handy selection of toys and DVDs, along with TVs with access to UK TV channels including the all-important CBeebies! Children of all ages will enjoy playing with the on-site pets including dogs and miniature piglets. 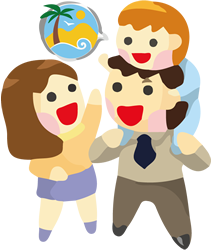 The Quintassential isn’t just for children, though, and it’s evident a lot of thought has gone into the needs of parents too. 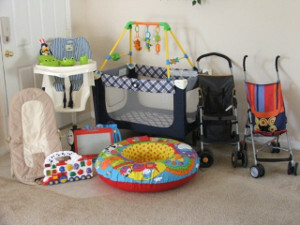 A wealth of baby and toddler equipment is available for guests to borrow free of charge including travel cots, moses baskets, high chairs, baby baths, a floor activity centre, feeding equipment, sterilisers, pottys and more – the list goes on! Parents can also borrow beach parasols, cool bags, buckets and spades for trips to the beach. All guests staying for a week or more receive a fabulous welcome hamper, and not just the usual small carton of milk – this one includes bread, milk, cheese, butter, water, juice, rose wine, red wine, crisps, biscuits and tea and coffee! We’re also pleased to see that the owners of the Quintassential share the Parent Friendly Stays view that family holidays can also include some special treats and ‘me time’ for mum and dad too: there are a range of fantastic optional extras available for a small fee including breakfast hampers, traditional Portuguese evening meal service, packed lunches, arrival night takeaways, champagne packages, laundry service, flowers and chocolates – we’ve never seen so many tempting treats on offer! Not to mention a reliable babysitting service and a fantastic hot tub for evening relaxation. The owners will even organise things like airport transfers and car hire delivery, if needed, and there’s WiFi available throughout. ‘Quintassential’ apparently means perfection or class – a bold claim! 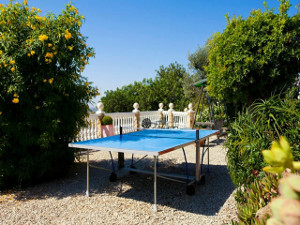 Here at Parent Friendly Stays we haven’t had the chance to experience holidays at the Quintassential yet so can’t confirm it lives up to this definition for definite, but we must admit we’re sorely tempted to test it out! The Quintassential has been painstakingly developed to provide relaxing family holidays with fantastic facilities, beautiful views and lots of extras to make a difference to your holiday. And with the child friendly attractions and gorgeous beaches of the beautiful Algarve coast on your doorstep, what more could anyone need? 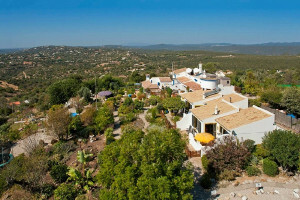 “We became the very proud owners of the Quintassential in April 2003, leaving Surrey in the UK behind, and have been blessed to since then be able to welcome guests to our holiday cottages located here in the central sunny Algarve. Perched high on a hilltop, we offer our guests an oasis of peace and tranquillity and we have commanding panoramic sea views, over 60 kms worth from Faro through to Portimão. Our great central location makes us an ideal base from which to explore the Algarve from. Faro International airport is just a 20 minute drive and many of the glorious blue flag beaches and world famous golf courses are just 15 minute drive from us. Our most local town is Loulé is a 5 minute drive and has everything you will need for a holiday, endless restaurants, cafes, supermarkets, banks, parks, historical buildings and is a town where there is something happening 365 days of the year. Take a drive into the Algarvian hills and discover pretty little villages, there really is so much to see and do, we know you will have to book a return visit or two to see what this amazing area in southern Portugal has to offer. If you’d like to find out more about family friendly holidays at The Quintassential, including booking and availability enquiries, just fill out the form below.